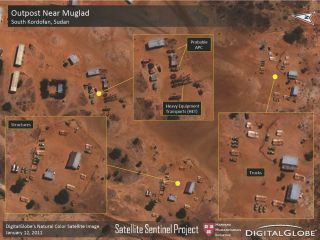 This image is one of several released in the first report from the Satellite Sentinel Project observing human rights issues in Sudan using satellites. Actor and activist George Clooney is spearheading the effort. Combine the unique perspective from satellites with Google Map Maker technology, toss in a generous helping of human caring, and you'll get the driving force behind the creation of an early-warning system to help prevent mass atrocities on Earth. Initiated by actor and activist George Clooney, the Satellite Sentinel Project is focusing global attention and sparking rapid responses on human rights and human security concerns. At its core is access to powerful camera-toting commercial satellites. UNOSAT-provided image of Juba, South Sudan, taken by QuickBird satellite. For the Satellite Sentinel effort, spacecraft imagery is being collected of the tense border between southern and northern Sudan. The political powder keg involves a new state being born in southern Sudan against a backdrop of decades of war between the south and north. A peace deal in 2005 ended a round of open conflict, but the likelihood of a return to war remains high as South Sudan prepares for independence. During a January referendum between Jan. 9 and Jan. 15, oil-rich South Sudanese cast their vote to secede from the north, according to the first full count from the landmark independence referendum. Analysts have contended that such a measure could throw the country back into civil war and spur the world’s next genocide. The Satellite Sentinel Project represents a melding of a number of groups: Not On Our Watch, Google, the Enough Project, the United Nations UNITAR Operational Satellite Applications Program (UNOSAT), the Harvard Humanitarian Initiative, and Trellon LLC, an Internet strategy and development firm delivering social media. A newcomer to the mix is MTV, pledging to encourage young people "to become peace monitors, inform their friends of the latest happenings in Sudan and be prepared to mobilize support should violence emerge." The message from Clooney and Enough Project co-founder John Prendergast underscores the initiative: "The world is watching because you are watching." Clooney points out that there has never been a nonstop civilian effort to methodically keep an eye on potential hot spots and threats to human security in near real-time, with the goal of stopping humanitarian disasters and war crimes before they happen. "War criminals thrive in the dark," Clooney said in a statement on the project. "It’s a lot harder to commit mass atrocities in the glare of the media spotlight." At the heart of the "Clooneysat" cause is use of commercial spacecraft that pass over the border of northern and southern Sudan. Using zoom-lens cameras, these satellites are able to snapshot potential threats to civilians, observe the movement of displaced people, detect bombed and razed villages, or note other evidence of pending mass violence. This satellite scanning is geared for near-real-time image gathering (within 24 to 36 hours). Appearing last month on ABC's "This Week" with Christiane Amanpour, Clooney said that the current $750,000 effort is six months in duration to ascertain its effectiveness, but would be continued longer. "I think this is an extremely interesting project on many levels — technologically, politically and academically," said David Yanagizawa-Drott of Harvard University, director of systemwide research and evaluation and responsible for investigating the role of Satellite Sentinel and its potential impacts. "Since there has never been anything like this before, at least of this scope and level, there is also very limited knowledge about what role these types of systems can play. As the situation in Sudan unfolds, I expect us to learn a lot in the next few months," Yanagizawa-Drott told SPACE.com. In a post-referendum notice on Jan. 27, the Satellite Sentinel Project confirmed that the Sudanese Armed Forces, or SAF, has deployed company-sized units of troops equipped with light armor and artillery in areas of South Kordofan around the oil-producing Abyei region and other strategic areas along Sudan’s volatile North-South border. However, the project’s first report also indicates that the SAF troops do not appear prepared for imminent forward movement. “These first images and analysis have deepened our understanding of the evolving situation following Southern Sudan’s historic vote on independence, " Clooney said in a statement. "Although the SAF in South Kordofan apparently remains a force largely in hiding, we showed they are field-deployed, and they are controlling major roads by running checkpoints. Though they are not showing signs of advancing, we confirmed that they’re equipped with helicopter transport, artillery, armored personnel carriers and trucks. Our first report represents the best recent information on the military situation in Sudan publicly available." Working in cooperation with the Satellite Sentinel endeavor is the United Nations Institute for Training and Research (UNITAR). Under that group’s wing is UNITAR’s Operational Satellite Applications Program – UNOSAT for short. UNOSAT is a technology-intensive program that delivers imagery analysis and satellite solutions to relief and development organizations within and outside the United Nations system to help make a difference in critical areas such as humanitarian assistance, human security, and strategic territorial and development planning. UNOSAT will expand its already ongoing activities related to Sudan and lead the Satellite Sentinel group on all issues related to geospatial imagery analysis and satellite imagery collection and analysis. Francesco Pisano, UNOSAT manager, said UNOSAT involvement in the Satellite Sentinel Project builds on previous successes in geospatial imagery acquisition and analysis in the fields of human rights and humanitarian relief. Actor and feet-on-the-ground activist, George Clooney, is tapping into satellite remote sensing to defuse tensions in Sudan. "George Clooney's initiative brings additional publicity to the work we have been doing for years. For us this is also a way to illustrate that our motto at UNITAR – "Knowledge to lead" – has concrete and tangible meaning," Pisano said. While a noble effort, making use of satellite surveillance to spotlight human rights violations is not without issues. "We got interested in using satellites for averting humanitarian catastrophes, or 'genocide prevention,' back in the early 1990s," said John Pike, director of GlobalSecurity.org, a public policy organization based in Alexandria, Va. The group delves into fields of defense, space, intelligence, weapons of mass destruction and homeland security. "We first took a crack at this task during the Kosovo campaign. It was quite path-breaking at the time – it was the first time the [satellite] source company had done an imagery download, as opposed to mailing the image on a CD-ROM. But the resolution, both spatial and temporal, of the available systems was not adequate to detect or demonstrate anything of interest," Pike told SPACE.com. More recently, imagery was used to monitor genocide in Darfur, Pike noted. "But overall, the results were again unremarkable and no one really paid any attention to this work by the United Nations," Pike explained. "Our conclusions were that a number of conditions had to be met for satellite imagery to play a useful role in humanitarian intervention," he added, "and there would be many humanitarian catastrophes where these conditions would not be met." Pike said that he remains skeptical about use of satellite imagery in support of Clooney's initiative. "I think the necessary conditions of a distinctive and readily apparent signature in an otherwise unpublicized event are unlikely to be met in this case," Pike said. "This project has already gotten most of the public visibility it will receive. I wish it were otherwise, but there are many things I wish were otherwise."